NASA's Curiosity rover has taken significant steps toward understanding how Mars may have lost much of its original atmosphere. Learning what happened to the Martian atmosphere will help scientists assess whether the planet ever was habitable. 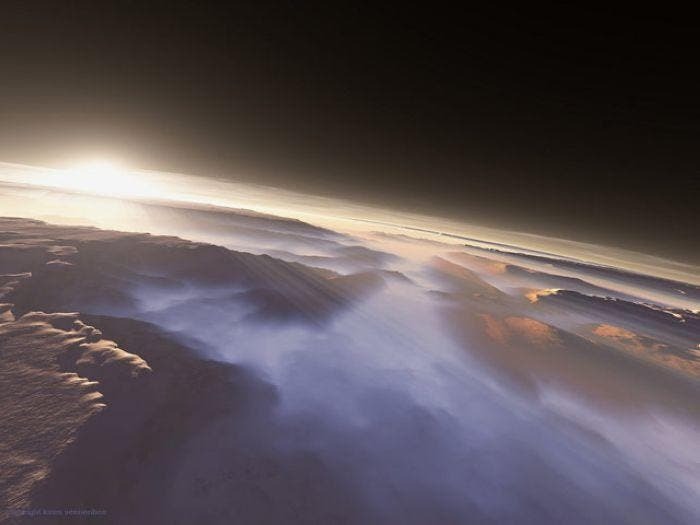 The present atmosphere of Mars is 100 times thinner than Earth's. A set of instruments aboard the rover has ingested and analyzed samples of the atmosphere collected near the "Rocknest" site in Gale Crater where the rover is stopped for research. Findings from the Sample Analysis at Mars (SAM) instruments suggest that loss of a fraction of the atmosphere, resulting from a physical process favoring retention of heavier isotopes of certain elements, has been a significant factor in the evolution of the planet. Isotopes are variants of the same element with different atomic weights. Preliminary results reveal little to no methane. Methane is of interest as a simple precursor chemical for life. On Earth, it can be produced by either biological or non-biological processes. Methane has been difficult to detect from Earth or the current generation of Mars orbiters because the gas exists on Mars only in traces, if at all. The Tunable Laser Spectrometer (TLS) in SAM provides the first search conducted within the Martian atmosphere for this molecule. 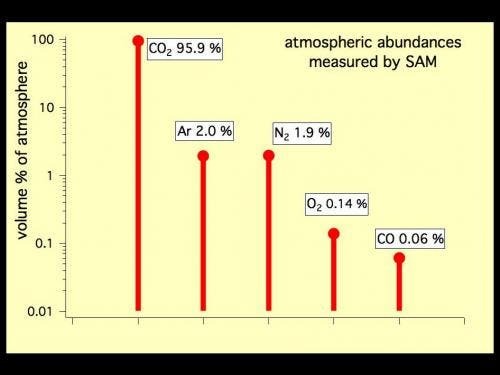 The initial SAM measurements place an upper limit of just a few parts methane per billion parts of Martian atmosphere, by volume, with enough uncertainty that the amount could be zero. If the atmosphere of Mars contains methane, various possibilities have been proposed for where the methane could come from and how it could disappear. Potential non-biological sources for methane on Mars include comets, degradation of interplanetary dust particles by ultraviolet light, and interaction between water and rock. A potential biological source would be microbes, if microbes have ever lived on Mars. Potential sinks for removing methane from the atmosphere are photochemistry in the atmosphere and loss of methane to the surface. SAM is set to analyze its first solid sample in the coming weeks, beginning the search for organic compounds in the rocks and soils of Gale Crater. Analyzing water-bearing minerals and searching for and analyzing carbonates are high priorities for upcoming SAM solid sample analyses. Researchers are using Curiosity's 10 instruments to investigate whether areas in Gale Crater ever offered environmental conditions favorable for microbial life. The SAM instrument was developed at Goddard with instrument contributions from Goddard, JPL and the University of Paris in France. The graph below shows the percentage abundance of five gases in the atmosphere of Mars, as measured by the Quadrupole Mass Spectrometer instrument of the Sample Analysis at Mars instrument suite on NASA's Mars rover in October 2012.